Division of Newborn Medicine, Department of Pediatrics, Oakland University William Beaumont School of Medicine, Beaumont Children’s Hospital, Royal Oak, Mich. In this review, I present an approach to managing the jaundiced newborn that is based on published guidelines.2–5 The aim is to help clinicians identify and manage jaundice in the newborn, intervene when appropriate and, when possible, prevent bilirubin-induced brain damage. It would be ideal if the published guidelines for the management of hyperbilirubinemia, including treatment with phototherapy and exchange transfusion, were based on estimates of when the benefit of these interventions exceeded their risks and costs. These estimates should come from randomized trials or high-quality, systematic observational studies, but such studies are rare. Guidelines must therefore rely on relatively uncertain estimates of risk and benefits, often from conflicting results. In addition, use of a single peak bilirubin level to predict long-term behavioural and developmental outcomes is not reliable and will often lead to conflicting results. Because of the lack of evidence, current guidelines are mainly based on consensus, as are the recommendations included in this article. Herein, I discuss the management of infants of 35 or more weeks of gestation, cared for in well-baby nurseries, and do not address hyperbilirubinemia in more premature infants. A complete discussion of the approach to the preterm infant can be found in a recent publication.6 A summary of the evidence used in this review appears in Box 1. The goal of this review is to help clinicians who care for newborns to identify and manage those with jaundice. On a monthly basis over the last 40 years, I have searched MEDLINE for English-language articles using the terms “newborn jaundice,” “hyperbilirubinemia,” “phototherapy,” “bilirubin encephalopathy” and “kernicterus.” I also reviewed articles on these subjects in the Cochrane Database of Systematic Reviews, as well as recent textbooks, all published from 2000 to 2013. In addition, I reviewed the guidelines on newborn jaundice of the American Academy of Pediatrics, the Canadian Paediatric Society and the UK National Institute for Health and Clinical Excellence. Why do newborns become jaundiced? If carefully examined in the first few days after birth, more than 80% of all term and late preterm infants will have some degree of jaundice.7,8 Almost every infant will have a total serum bilirubin level that is above the normal maximum adult level of 17.1 μmol/L (1 mg/dL) because they have an increased turnover of erythrocytes, produce more than twice the amount of bilirubin produced daily by an adult9 and have a transient deficiency in their ability to conjugate and clear bilirubin. This imbalance between bilirubin production and conjugation is fundamental to the pathogenesis of neonatal bilirubinemia.10 It results in a steady increase in total serum bilirubin levels for the first three to five days, and sometimes more (Figure 1), followed by a decrease in levels as the rate of bilirubin production declines and conjugation improves. 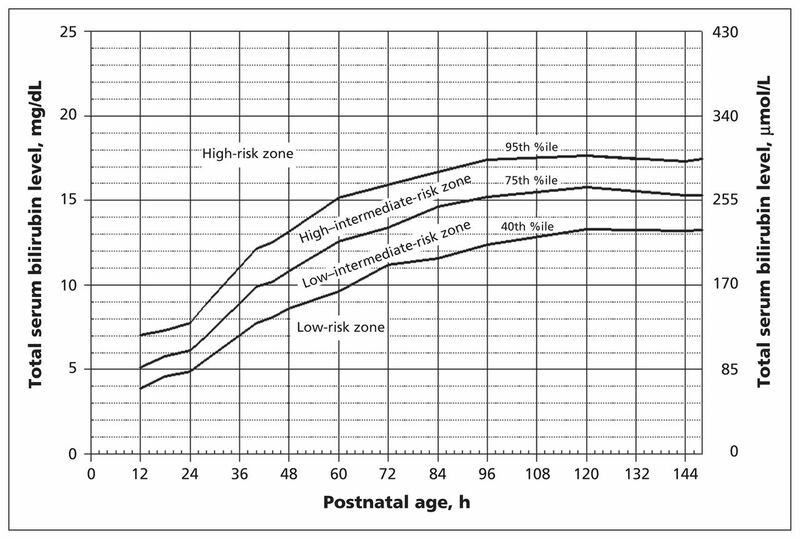 Nomogram for designation of risk among 2840 well newborns at ≥ 36 weeks’ gestation and birth weight ≥ 2000 g, or at ≥ 35 weeks’ gestation and birth weight ≥ 2500 g, based on the hour-specific serum bilirubin values. The serum bilirubin level was obtained before discharge, and the zone in which the value fell predicted the likelihood of a subsequent bilirubin level exceeding the 95th percentile. Because of sampling bias, this nomogram should not be used to represent the natural history of neonatal hyperbilirubinemia. Reproduced with permission from the American Academy of Pediatrics guidelines,3 Pediatrics 2004;114:297–316. Copyright © 2004 American Academy of Pediatrics. What are normal and potentially harmful bilirubin levels? How often does kernicterus occur? Several countries, including the US (American Academy of Pediatrics, 2004),3 Canada (Canadian Paediatric Society, 2007)4 and the United Kingdom (National Institute for Health and Clinical Excellence),2 have published guidelines on the care of the jaundiced newborn, and an update of the American Academy of Pediatrics guideline was published in 2009.5 The 2009 update clarified the difference between “hyperbilirubinemia risk factors” and “neurotoxicity risk factors,” made a firm recommendation for the measurement of total serum bilirubin or transcutaneous bilirubin in every infant before discharge, and provided a structured algorithm for follow-up based on the presence of risk factors for hyperbilirubinemia and the zone in which the predischarge levels of total serum bilirubin or transcutaneous bilirubin fell (Figure 2). The key elements of the 2004 American Academy of Pediatrics guidelines are listed in Box 2, and the hyperbilirubinemia and neurotoxicity risk factors in Boxes 3 and 4. From an analysis of the cases reported to the pilot USA Kernicterus Registry17 and the experience of those who have reviewed numerous malpractice cases involving kernicterus, the failure of clinicians to follow these guidelines accounts for most, but not all, of the kernicterus cases seen today. 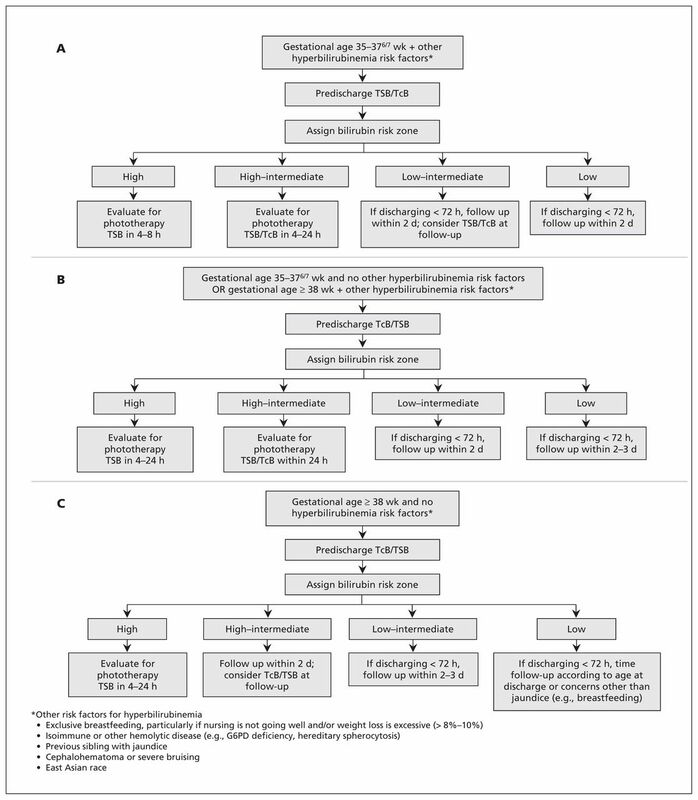 Algorithm providing recommendations for management and follow-up according to predischarge bilirubin measurements, gestational age and risk factors for subsequent hyperbilirubinemia. G6PD = glucose-6-phosphate dehydrogenase. Provide lactation evaluation and support for all breastfeeding mothers. Recommendation for timing of repeat total serum bilirubin (TSB) or transcutaneous bilirubin (TcB) measurement depends on infant’s age at measurement and how far the level is above the 95th percentile (Figure 1); higher and earlier initial levels require an earlier repeat measurement. Perform standard clinical evaluation at all follow-up visits. Reproduced with permission from Maisels et al.,5 Pediatrics 2009;124:1193–8. Copyright © 2009 American Academy of Pediatrics. G6PD = glucose-6-phosphate dehydrogenase. Reproduced with permission from Maisels et al.,5 Pediatrics 2009;124:1193–8. Copyright © 2009 American Academy of Pediatrics. Why does kernicterus still occur in the developed world? Furthermore, hospital stays are now short. It was easy to monitor jaundice and measure total serum bilirubin levels when infants remained in hospital for three or more days after birth. Today, an infant delivered vaginally is often discharged well before age 48 hours and, in some cases, before 24 hours. 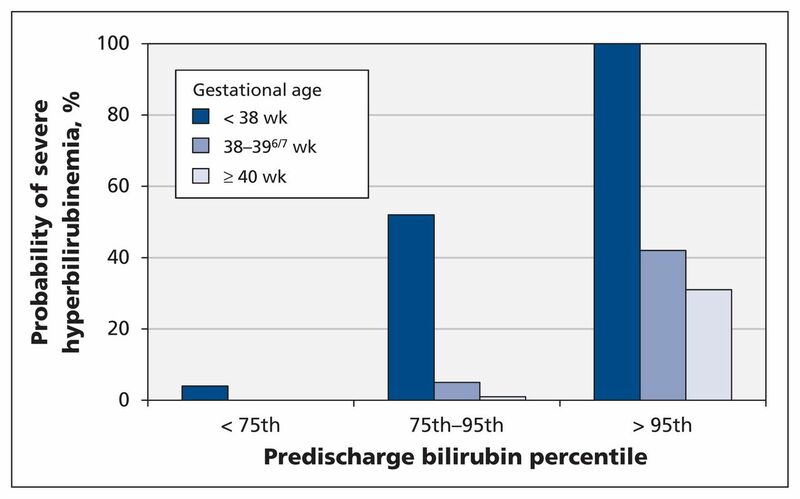 Figure 1 shows that bilirubin levels usually peak on the fourth or fifth day after birth. Identification and management of the jaundiced infant has therefore changed from an inpatient to an outpatient problem, which is why appropriate outpatient follow-up is so important3–5 (Figure 2). Because jaundice progresses cephalocaudally from face to trunk and then to the extremities, for a given bilirubin level, the skin of the face will appear more yellow than that of the foot.23 It has been suggested that this phenomenon is the result of regional differences in skin temperature and skin perfusion,24 but recent data suggest that this may not be correct.21 Cephalocaudal progression is graded 0 through 5.22 In a prospective cohort study of the accuracy of predischarge visual assessment of jaundice in term and late preterm infants, only 1 of 100 infants without jaundice (cephalocaudal grade of 0) subsequently had hyperbilirubinemia, for a negative predictive value of 99%.22 Therefore, complete absence of jaundice is reassuring. But jaundice in the arms and legs below the knees (a grade of 4 or 5) was strongly associated with the development of clinically significant hyperbilirubinemia (odds ratio 6.0, 95% confidence interval [CI] 2.1–17.0).22 Nevertheless, because there is a wide range of bilirubin levels associated with each cephalocaudal grade,21,22 it is not possible to provide an accurate visual estimate of a bilirubin level. How else might we assess a newborn with jaundice? Because transcutaneous bilirubin measurement tends to underestimate the total serum bilirubin level at higher serum levels, various techniques have been adopted to avoid missing a high total serum bilirubin level (i.e., a false-negative transcutaneous measurement). Investigators recommend measuring the total serum bilirubin level if the transcutaneous level is at 70% of the serum level recommended for the use of phototherapy;33 the transcutaneous level is above the high intermediate risk line (75th percentile) on the Bhutani nomogram (Figure 1) or the 95th percentile on a transcutaneous bilirubin nomogram;16,34 or the transcutaneous level at follow-up after discharge is above 222 μmol/L (13 mg/dL).26,32 In two outpatient studies, no infant who had a transcutaneous bilirubin level of 222 μmol/L or less had a total serum bilirubin level equal to or greater than 290 μmol/L (17 mg/dL).26,32 In one of the studies, the highest of three independent measurements with the Dräger JM-103 (not the average of three) was used for screening.26 This method significantly reduced the risk of false-negative results but increased the risk of false-positive ones. The current cost of a transcutaneous bilirubin instrument is about US$6000, which unfortunately may deter practising physicians from purchasing one. The BiliChek also requires the use of a calibration tip (US$10 per tip) before each measurement. Can we predict which infant will have severe hyperbilirubinemia? 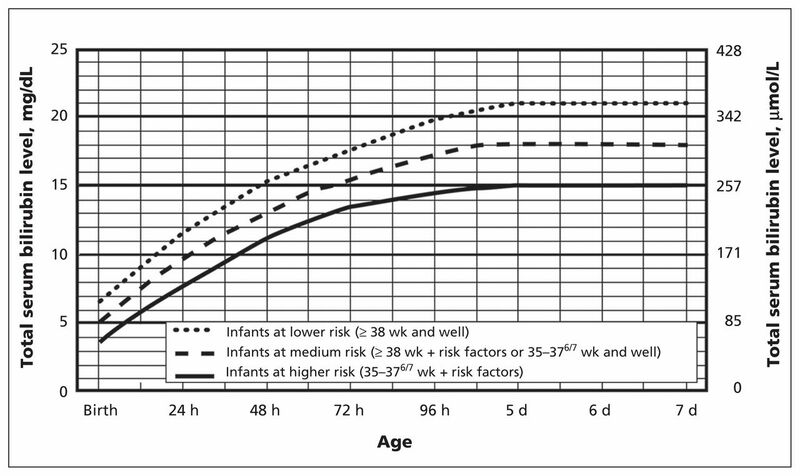 The Bhutani nomogram (Figure 1)18 has been widely used to predict which infants are or are not at risk of hyperbilirubinemia. In the original study, 39.5% of infants whose total serum bilirubin levels before discharge were in the high-risk zone subsequently had levels above the 95th percentile, as compared with none of the 1750 infants whose predischarge bilirubin level was in the low-risk zone. Nevertheless, subsequent studies have shown that some infants with a predischarge transcutaneous bilirubin level in the low–intermediate or low-risk zone will go on to have total serum bilirubin levels that meet the requirement for phototherapy.31 Appropriate follow-up for all infants is essential, even if they appear to be at low risk of severe hyperbilirubinemia. The algorithm in Figure 2 tells us how to manage and follow infants according to their gestational age and risk factors for hyperbilirubinemia, provided the predischarge bilirubin level is known.5 The early discharge of newborns following delivery makes appropriate follow-up mandatory for the prevention of severe hyperbilirubinemia and kernicterus. What is the role of G6PD deficiency in severe hyperbilirubinemia? Newborns with G6PD deficiency appear completely normal and often have a normal total serum or transcutaneous bilirubin level soon after birth. However, following discharge, exposure to an oxidative stress such as naphthalene (found in mothballs), or infection or, most often, an undetermined trigger, can produce an acute hemolytic event and a rise in total serum bilirubin to a hazardous level in a matter of hours.36,37 Because there is no way of predicting these exposures to oxidative stress, the current systems of monitoring and surveillance are inadequate to prevent these unpredictable events. Can we prevent hyperbilirubinemia in breastfed infants? There are three ways of treating hyperbilirubinemia, but phototherapy is the treatment used today in the overwhelming majority of newborns. The other treatment methods — exchange transfusion and pharmacologic intervention — are beyond the scope of this review. Phototherapy lowers the bilirubin level by converting the bilirubin molecule to products that can bypass the liver’s conjugating system and be excreted in the bile or in the urine without further metabolism. The American Academy of Pediatrics guidelines for implementing phototherapy in infants at 35 or more weeks of gestation are shown in Figure 43,5 and have been widely adopted in Canada4 and many other countries. The total serum bilirubin level at which intervention is recommended is based on the gestational age and other neurotoxicity risk factors (Box 4). These risk factors are the laboratory and clinical factors that might increase the risk of brain damage in an infant who has hyperbilirubinemia. Intervention is recommended at a lower total serum bilirubin level when any of the neurotoxicity risk factors are present (Figure 4). Guidelines for phototherapy in inpatient newborns at ≥ 35 weeks’ gestation. Use total serum bilirubin. Do not subtract direct reacting or conjugated bilirubin. The lines for lower, medium and higher risk refer to risk of neurotoxicity (for neurotoxicity risk factors, see Box 4). For well infants at 35 to 376/7 weeks’ gestation, total serum bilirubin levels can be adjusted for intervention around the medium risk line. It is an option to intervene at lower levels for infants closer to 35 weeks’ gestation and at higher levels for infants closer to 376/7 weeks’ gestation. Conventional phototherapy can be provided in hospital or at home at total serum bilirubin levels of 2–3 mg/dL (35–50 μmol/L) below those shown, but home phototherapy should not be used in any infant with risk factors. These guidelines refer to the use of intensive phototherapy, which should be used when the total serum bilirubin level exceeds the line indicated for each category. Infants are designated as higher risk because of the potential negative effects of the conditions listed on albumin binding of bilirubin,41–43 the blood–brain barrier44 and the susceptibility of the brain cells to damage by bilirubin.44 Intensive phototherapy implies irradiance in the blue–green spectrum (wavelengths of about 430–490 nm) of at least 30 μW/cm2 per nanometre (measured at the infant’s skin directly below the centre of the phototherapy unit) and delivered to as much of the infant’s surface area as possible. Note that irradiance measured below the centre of the light source is much greater than that measured at the periphery. Measurements should be made with a radiometer specified by the manufacturer of the phototherapy system. If the total serum bilirubin level does not decrease or continues to rise in an infant who is receiving intensive phototherapy, this strongly suggests the presence of hemolysis. Reproduced with permission from Maisels et al.,5 Pediatrics 2009;124:1193–8. Copyright © 2009 American Academy of Pediatrics. The purpose of phototherapy in infants at 35 or more weeks of gestation is to prevent the need for an exchange transfusion, and in this respect it has been an overwhelming success.45 But how many infants need to receive phototherapy to prevent one from requiring an exchange transfusion (the number needed to treat [NNT])? Newman and colleagues46 estimated the number to be 10 (95% CI 6–19) for a male infant at 36 weeks’ gestation who is less than 24 hours old. But for a female infant at 41 weeks’ gestation who is 3 or more days old, the NNT was 3041 (95% CI 888–11 096), which strongly suggests that phototherapy could be avoided in many infants who are more mature (e.g., ≥ 39 wk). Instead of routinely admitting infants with hyperbilirubinemia for treatment, we should consider other options, such as improved lactation support or formula supplementation.47,48 This latter option, although opposed by some, deserves serious consideration when one considers the alternative and cost of hospital admission and phototherapy to a blindfolded infant, an intervention that interferes with parent–infant bonding, interrupts breastfeeding and is, at the very least, disturbing for the parents. Complications associated with phototherapy include DNA damage, alterations in cytokine levels and oxidative stress,49 and one study found an increase in the development of melanocytic nevi.50 In one randomized controlled trial, supplementation with a whey/casein (60/40) formula significantly decreased transcutaneous bilirubin levels in breastfed newborns in the first week.47 In another trial, substituting formula for breastfeeding for two days was as effective as phototherapy in reducing the total serum bilirubin level.51 Other options include the use of home phototherapy, or simply repeating the measurement of total serum bilirubin after several hours. In many cases, the level will have decreased.48 If 3000 infants need to receive phototherapy to prevent 1 from requiring an exchange transfusion, it is reasonable to ask whether, in many of these infants, phototherapy could have been avoided. The management of jaundice in the newborn is a challenge because of the desire to avoid the devastating outcome of kernicterus while minimizing testing and treatment in the majority of newborns, who will do perfectly well with no interventions for jaundice. By simply combining the gestational age with the predischarge, hour-specific bilirubin level (transcutaneous or total serum level), one can, with considerable confidence, quantify the risk of severe hyperbilirubinemia in most newborns. With appropriate follow-up of infants, most cases of kernicterus can be prevented, although G6PD deficiency remains an important challenge. Continued evaluation of the screening and follow-up of newborns with jaundice will help to gauge the effectiveness of current recommendations and to determine their impact, if any, on the incidence of hyperbilirubinemia and kernicterus. Kernicterus or chronic bilirubin encephalopathy, a condition that should be largely preventable, is still occurring in the developed world. Serum bilirubin levels in newborns can be interpreted only according to the infant’s age in hours. Before discharge from the nursery, every infant should have his or her total serum bilirubin or transcutaneous bilirubin level measured. Combining this measurement with the infant’s gestational age provides an excellent prediction of hyperbilirubinemia risk. With few exceptions, infants who are discharged before age 72 hours should be seen within two days after discharge. Competing interests: Jeffrey Maisels is a consultant to Dräger Medical Inc., the supplier of the JM-103 transcutaneous bilirubinometer.
. Incidence of chronic bilirubin encephalopathy in Canada, 2007–2008. Pediatrics 2012;130:e886–90.
. Neonatal jaundice: summary of NICE guidance. BMJ 2010;340:C2409. American Academy of Pediatrics, Subcommittee on Hyperbilirubinemia. Clinical practice guideline: management of hyperbilirubinemia in the newborn infant 35 or more weeks of gestation. Pediatrics 2004;114:297–316. Canadian Paediatric Society. Guidelines for detection, management and prevention of hyperbilirubinemia in term and late preterm newborn infants (35 or more weeks’ gestation) — summary. Paediatr Child Health 2007;12:401–18.
. Hyperbilirubinemia in the newborn infant > 35 weeks’ gestation: an update with clarifications. Pediatrics 2009;124:1193–8. , editors. Care of the jaundiced neonate. New York: McGraw Hill; 2012.
. A comparison of alternative risk-assessment strategies for predicting significant neonatal hyperbilirubinemia in term and near-term infants. Pediatrics 2008;121:e170–9.
. Predischarge screening for severe neonatal hyperbilirubinemia identifies infants who need phototherapy. J Pediatr 2013;162:477–82.e1.
. Endogenous production of carbon monoxide in normal and erythroblastotic newborn infants. J Clin Invest 1971;50:1–8.
. Imbalance between production and conjugation of bilirubin: a fundamental concept in the mechanism of neonatal jaundice. Pediatrics 2002;110:e47.
. Frequency of neonatal bilirubin testing and hyperbilirubinemia in a large health maintenance organization. Pediatrics 1999;104:1198–203.
. The epidemiology of neonatal hyperbilirubinemia. In: Stevenson DK, Maisels MJ, Watchko JF, editors. Care of the jaundiced neonate. New York: McGraw Hill; 2012:97–113.
. Prediction of hyperbilirubinemia in near-term and term infants. Pediatrics 2001;108:31–9.
. Kernicterus. In: Stevenson DK, Maisels MJ, Watchko JF, editors. Care of the jaundiced neonate. New York: McGraw Hill; 2012:229–42.
. Bilirubin toxicity. In: Stevenson DK, Maisels MJ, Watchko JF, editors. Care of the jaundiced neonate. New York: McGraw Hill; 2012:115–43.
. Prevention, screening, and postnatal management of neonatal hyperbilirubinemia. In: Stevenson DK, Maisels MJ, Watchko JF, editors. Care of the jaundiced neonate. New York: McGraw Hill; 2012:175–94.
. Clinical report from the pilot USA Kernicterus Registry (1992 to 2004). J Perinatol 2009; 29:S25–45.
. Predictive ability of a predischarge hour-specific serum bilirubin for subsequent significant hyperbilirubinemia in healthy-term and near-term newborns. Pediatrics 1999;103:6–14.
. Predicting hyperbilirubinemia in newborns: the importance of timing. Pediatrics 1999;103: 493–5.
. Prevalence of glucose-6-phosphate dehydrogenase deficiency in US army personnel. Mil Med 2006;171:905–7.
. The natural history of jaundice in predominantly breast-fed infants. Pediatrics 2014; 134:e340–5.
. Visual assessment of jaundice in term and late preterm infants. Arch Dis Child Fetal Neonatal Ed 2009;94:F317–22.
. Advancement of dermal icterus in the jaundiced newborn. Am J Dis Child 1969;118:454–8.
. The influence of skin temperature and skin perfusion on the cephalocaudal progression of jaundice in newborns. J Paediatr Child Health 2009;45:582–6.
. Noninvasive measurement of total serum bilirubin in a multiracial predischarge newborn population to assess the risk of severe hyperbilirubinemia. Pediatrics 2000;106:E17.
. Transcutaneous bilirubin levels in an outpatient and office population. J Perinatol 2011;31:621–4.
. Noninvasive measurements of bilirubin. Pediatrics 2012;129:779–81.
. Impact of a transcutaneous bilirubinometry program on resource utilization and severe hyperbilirubinemia. Pediatrics 2012;129:77–86.
. Trancutaneous bilirubinometry decreases the need for serum bilirubin measurements and saves money. Pediatrics 1997;99:599–601.
. Neonatal transcutaneous bilirubin measurements: an opportunity to enhance laboratory utilization and improve patient care. Clin Chem 2012;58:1395–6.
. Routine transcutaneous bilirubin measurements combined with clinical risk factors improve the prediction of subsequent hyperbilirubinemia. J Perinatol 2009;29:612–7.
. Evaluation of a transcutaneous jaundice meter following hospital discharge in term and near-term neonates. J Perinatol 2005;25:486–90.
. A new transcutaneous bilirubinometer, BiliCheck, used in the neonatal intensive care unit and the maternity ward. Acta Paediatr 2002; 91:203–11.
. Transcutaneous bilirubin levels in the first 96 hours in a normal newborn population of 35 or more weeks’ of gestation. Pediatrics 2006;117:1169–73.
. Impact of universal bilirubin screening on severe hyperbilirubinemia and phototherapy use. Pediatrics 2009;124:1031–9.
. Should we screen newborns for glucose-6-phosphate dehydrogenase deficiency in the United States? J Perinatol 2013;33:499–504.
. Hemolytic disorders and their management. In: Stevenson DK, Maisels MJ, Watchko JF, editors. Care of the jaundiced neonate. New York: McGraw Hill; 2012:145–73.
. Kernicterus (final report). In: Canadian Paediatric Surveillance Program 2009 results. Ottawa: Canadian Paediatric Society and Public Health Agency of Canada; 2009:30–2. Available: www.cpsp.cps.ca/uploads/publications/Results-2009.pdf (accessed 2014 Sept. 11).
. Effect of fasting on the uptake of bilirubin and sulfobromophthalein by the isolated perfused rat liver. Gastroenterology 1997;113:1707–13. Breastfeeding in the hospital, the postpartum period. In: Breastfeeding handbook for physicians. Washington (DC): American Academy of Pediatrics, American College of Obstetricians and Gynecologists; 2006:81–99.
. Free bilirubin concentrations and bilirubin-binding affinity in term and preterm infants. J Pediatr 1980; 96:521–7.
. Reserve albumin and bilirubin toxicity index in infant serum. Acta Paediatr Scand 1983; 72:415–9.
. Toward understanding kernicterus: a challenge to improve the management of jaundiced newborns. Pediatrics 2006;117:474–85.
. How bilirubin gets into the brain. Clin Perinatol 1990; 17:449–65.
. Phototherapy — traditional and nontraditional. J Perinatol 2001;21:S93–7.
. Numbers needed to treat with phototherapy according to American Academy of Pediatrics guidelines. Pediatrics 2009;123: 1352–9.
. A controlled, randomized, double-blind trial of prophylaxis against jaundice among breastfed newborns. Pediatrics 2005;116:385–91.
. Hyperbilirubinemia in the breast-fed newborn: a controlled trial of four interventions. Pediatrics 1993;91:470–3.
. Phototherapy and other treatments. In: Stevenson DK, Maisels MJ, Watchko JF, editors. Care of the jaundiced neonate. New York: McGraw Hill; 2012:195–227.
. Neonatal blue light phototherapy and melanocytic nevi: a twin study. Pediatrics 2011;128:e856–64.
. Interruption of breast-feeding vs. phototherapy as treatment of hyperbilirubinemia in full term infants. Helv Paediatr Acta 1985;40:127–31.